I really am starting to think this segment should be called "Stardust Swatches" instead of "Quickie Swatch" since the 3 out of 4 of them have been Stardust Polishes lol. I swear I will have more variety eventually and this really is a coincidence... well kind of I guess. I like my "Quickie Swatches" to be the latest polish I have purchased and well I buy a lot of Stardust. The beauty I have to share with you guys was a Christmas gift from Drema, thank you so much dear, called Olivia. 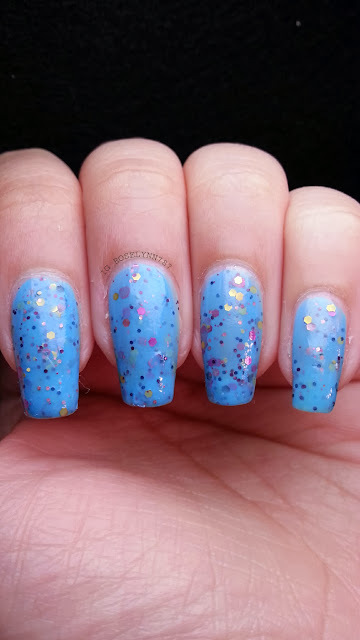 Olivia is breathtaking shade of sky blue mixed with various pink, gold, black, purple, and blue glitters. 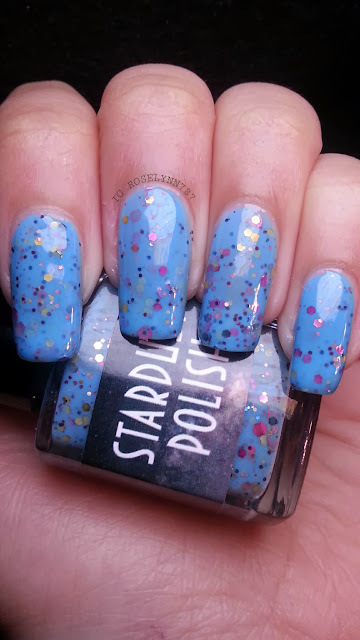 The vibrant base blends so well with the multitude of colored glitters and makes for an eye-catching mani! Swatched over a clear base coat, using 3 thin coats of polish, and sealed with a fast drying topcoat. You can achieve full opacity with only 2 thin coats, however, I prefer adding that 3rd coat to make it really pop. As always guys, you will want to shake well before using. 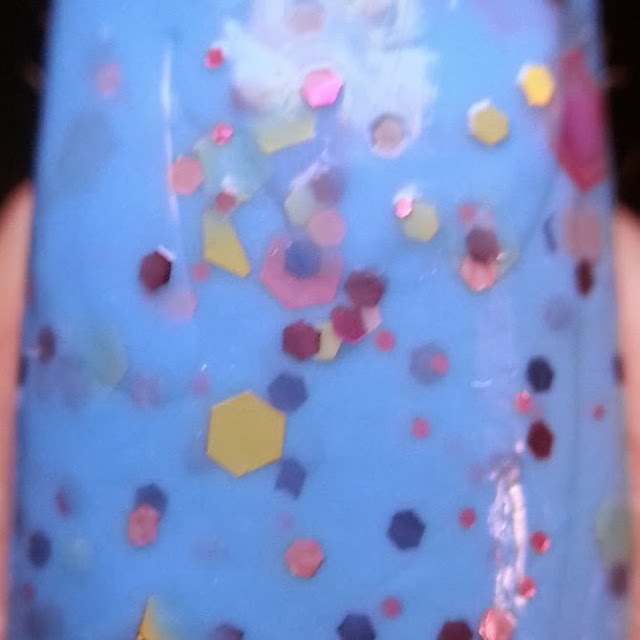 To make sure I capture a good amount of glitter, I like to shake well between painting each nail. That's just what I like to do but it's definitely not needed, no fishing for glitter with this beauty. 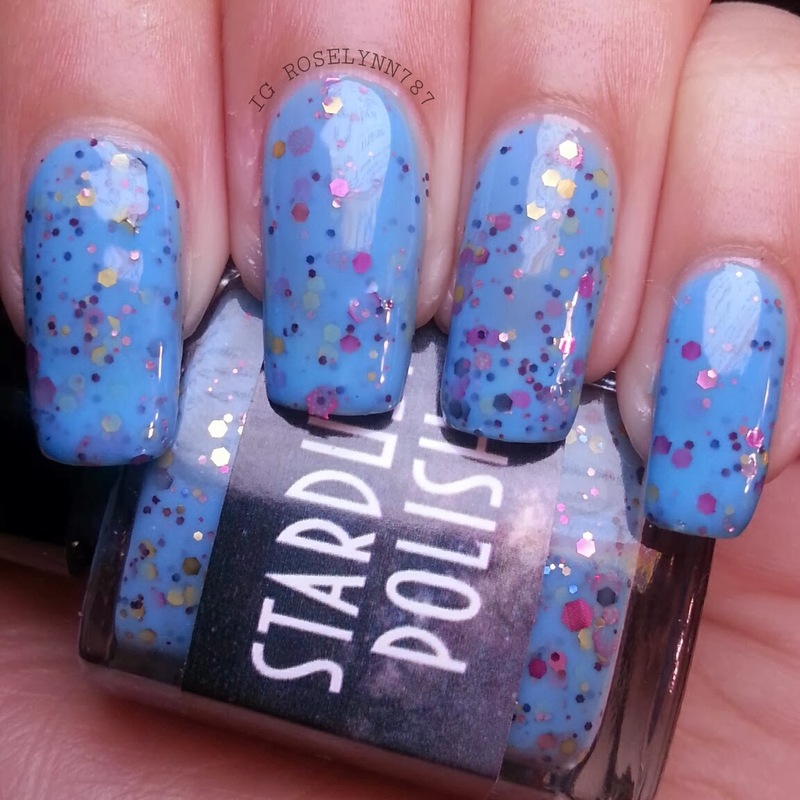 Stardust polishes always have a great application and this is no exception to that high quality I have come to expect. I do apologize for not having more photos to share with you guys as I normally do. I was actually really tired last night and ended up falling asleep shortly after painting my nails and managing to take a hand full of shots. I would of taken more this morning, but unfortunately they weren't fully dry and I ended up smudging them along my face :( Hopefully though you can still appreciate the beauty of this creation and pay Stardust Polish some love. I believe at the moment this polish is sold out but make sure you follow her on Instagram for restock info! Thanks again Drema for this beautiful polish and I can't wait to see what else you come up with in 2014! Happy New Year everyone!